When I started getting back into the board game hobby in 2009 I had no idea how much I would fall back in love with it. I’ve gone from owning just Blokus and Ingenius back then to having a collection of over 100 games less than five years later; from never having heard of Twilight Struggle to it now being the only game in the Top 20 (on BoardGameGeek) I haven’t played in one form or another. Quite a journey. But just playing wasn’t enough. Oh no. I stumbled on the Playtest UK group on Meetup and from there the more local Cambridge Playtesters* – and started on my game design journey. And while I don’t think Reiner, Uwi, Friedermann and the rest have too much to worry about for now, I have now at least got my first design into a playable – even downloadable – form. The Empire Engine has left the building. The mainstay of the Cambridge Playtest group is Brett Gilbert*, a published game designer whose fantastic Divinare was on the recommended list for the Spiel de Jahres this year (the undisputed worldwide king of board game design award). One evening he told us about an idea he was hatching for a website that would be full of ‘microgames’ from a whole host of designers and that we were all welcome to submit things if they fit the criteria. The games needed have no more than 18 cards, plus a few extra bits (dice, tokens etc) that players could provide easily themselves. While he didn’t intend it as one, the challenge (for me at least) had been set. I went away and thought about the types of mechanisms I liked best in games, and how they might fit into such a limited number of cards. My first thought was worker placement (an idea I still haven’t completely given up on), but I ended up settling on the rondel mechanism so beautifully realised by Mac Gerdts. If you’re unfamiliar with it, Gerdts’ rondel is a static wheel (drawn on the game board) that is divided into eight sections, each of which represents an action. Each player has a single piece they place onto this wheel in the first game round, then take the appropriate action. In future turns they move their piece around the wheel to take different actions – the catch being they can only advance up to to three spaces clockwise around the wheel without paying a penalty. As you can imagine, this makes decisions decidedly tricky as you weigh efficiency in time versus efficiency in expenditure. 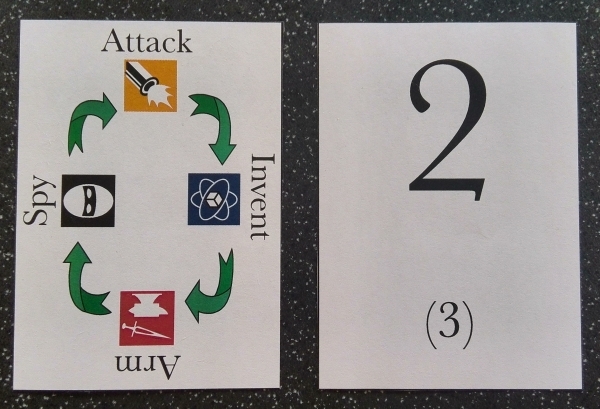 This actually translated quite easily in my mind into card form; cards have four sides, so that’s two clockwise-turning ‘rondel’ cards each per player (rather than placing pieces on the cards) – which also meant two actions each per round per player; not much of a diversion, and hopefully an interesting one – especially as there wasn’t going to be a board to add a spacial element to the game. I do love a good theme in a game and up until this point every game I’d tried to design had been theme first (and they have since too). 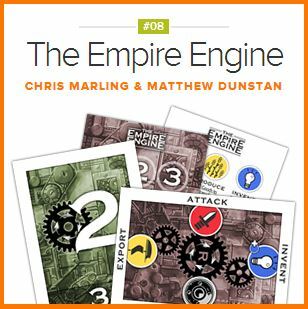 The Empire Engine was totally mechanics first, with theme pasted on afterwards, and is the only one I’ve finished. Note to self: learn this lesson? Discuss. 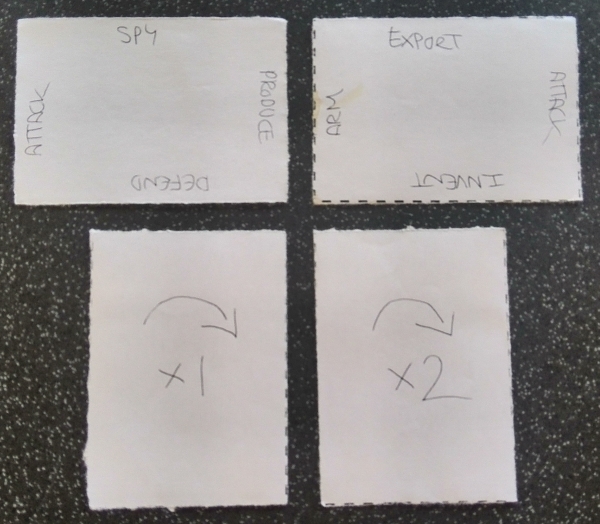 I centred on a simple and proven action structure, taking three sides from the classic ‘4X’ gaming standard: expand, exploit and exterminate (I left explore out, thanks to the lack of board!). This led me to arm/attack/defend; harvest/export; and invent/salvage. I’d decided each rondel would point at a different opponent, so seven actions meant ‘attack’ could be on both rondel cards. 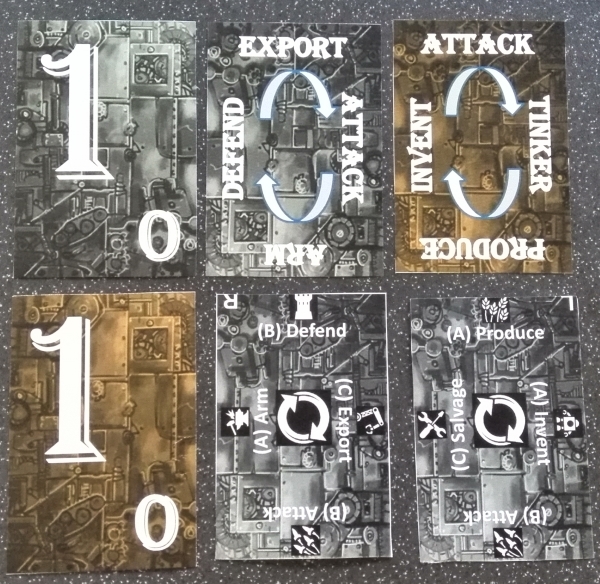 The actions offered themselves to a simple system; you’d either be drawing tokens/chips to represent resources you’d collected (arm, harvest, invent/salvage) or turning them into victory points (successfully attacking or exporting). This also lent itself well to three scoring types – military, export and technology – which could be totted up to decide a winner. I drew some actions on some bits of paper and headed to the pub for playtest night. Putting something you’ve created in front of your peers is an extraordinarily nerve-racking experience. I’ve been doing it for years with writing, so that’s water off a duck’s back now; I’m much newer to game design. But the Cambridge playtest guys are a supportive yet critical and thoughtful bunch; the perfect combination, really. It’s usual to find the post-game conversation going on miles longer than the playtest itself. The other Cambridge Playtest organiser* is Matthew Dunstan. Back then he was a prolific yet unpublished designer; now he’s the man behind Days of Wonder’s 2013 release, Relic Runners. Luckily I talked him into co-designing this game before the fame, loose women, and custom meeples went to his head. He could see the design had promise and I was eager to enlist the help of someone who had been down the design path many times. It’s hard to quantify what Matt brought to the process without it sounding a bit trivial, which it was anything but. What I had was an idea that worked on paper, just; what Matt had was an analytical/numerical brain, experience, patience and an eye for gaming detail that were beyond me. Between us, following his lead, we started to refine my ideas into a better game. But the devil was most definitely in the detail and for a while this was amazingly frustrating for me; I’d had no idea you could be so close to being happy with something, but have so much trouble putting the damned thing in the can! One action in particular (that ended up as ‘Salvage’) changed pretty much every time we played. Or what seemed like a great idea on the way to test night actually broke the whole of the rest of the game, rather than fixing a small issue. Moving actions between the rondels until we had the right combination was critical and took a lot of tries to get right (something Matt nailed), balancing the risk/reward of some of the harder actions and trying to stop an obviously more powerful combination emerging. Timing was also a big concern, as I wanted as much of the play as possible to be simultaneous once cards were revealed. This for me was very important as I think it adds that element of ‘poker face’ to the game, which I enjoy watching most when others play. And a key part of this was hidden information – in what order would action choices be revealed, and how much could players either side of you deduce from this? Luckily Catan-style timing (used in setup for initial placement of settlements) fitted perfectly, but took a long while to get into the thought process. Fairness was also crucial, as we needed players to feel all mistakes were equally cruelly punished! For example initially you failed an attack action if you had no soldier, but if you tried to do an export action and had no goods you gained a good – which left an attacker feeling pretty hard done by in comparison. The other big challenge was the scoring system; something I don’t think I’ll ever be totally happy with (I expect for every game design there is something, but sooner or later you have to let go!). I think in the end we at least reasonably balanced the likelihood of gaining each type of scoring cube – and the hidden scoring really helps the game zip along. In terms of theme, stream punk had been obvious. Conflict, cards working as gears/cogs – it simply made sense (I came up with the name as a riff on Gibson & Sterling’s ‘The Difference Engine’ – which I really need to get round to reading). Luckily it was a genre comic fan Seb loved, which made his decision easier – plus the fact he only had to design one image (although he also did a brilliant job on the icons)! There is of course scope for more art (I’d love an image per player, for example), but one background image was the only real necessity. After a little to and fro, it was done (Brett did the final layout, which made a massive difference). I’d written a blog post previously entitled ‘Am I a board game designer?‘ in which I concluded that the answer was ‘no’ – something I’m still convinced is true today. But when the game went live on Brett’s Good Little Games website – and then on BoardGameGeek, the whole debate did start up in my mind again. I still feel a proper published game or two is the criteria, but I do get a (sad and pathetic I know) warm glow when I see the ‘Game Designer’ logo under my BGG avatar. I’m immensely chuffed to have gotten this far with a game design; even one as small as this. It has been a totally absorbing experience and although it’s on a very small scale it does give me a pretty strong sense of achievement. I’ll certainly continue to tinker with game ideas and hopefully one day something bigger, brighter will hit the table and again go beyond the initial idea and rules write up. 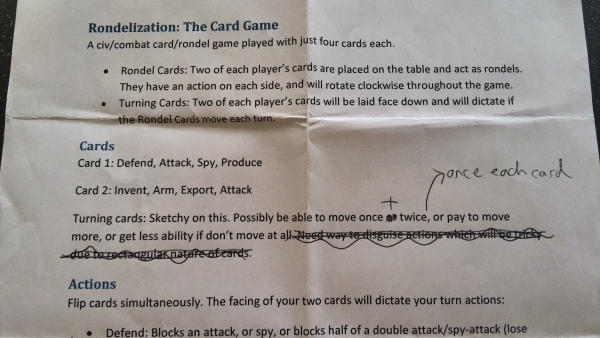 I’m not sure if this is the end of the road for The Empire Engine, or the mechanism of the cards as rondels. I certainly think we’ll tout the game to some publishers and after a break I’m going to think about extending the idea to a bigger format, including a board for that spatial element. But if it never gets beyond Good Little Games I’ll still be more than happy with what we’ve achieved. I’ve only mentioned Brett and Matt by name here because it was Brett’s idea/website and Matt is the game’s co-designer. But the playtesting and insightful input, as well as banter and general camaraderie, of the rest of the group can’t be overemphasised. We’re lucky to also have the Terror Bull Games (War on Terror, Crunch) guys along regularly too.